So your lips bring your whole face together when it comes to your makeup application, since its pretty much the last step to your face. It should be in harmony with your eyes, cheek color and foundation whilst giving vitality and lift your expression. Makeup is incomplete if the lips isn’t colored or glossed up. Only after lip color application, will your whole face be in harmony. Lip liner should be applied to the lips slowly and carefully no matter what color it is. 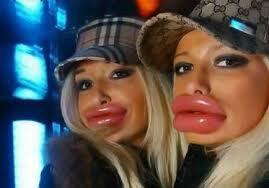 Lips are a very tricky feature of the face since it isn’t equal or a firm shape, size or length. If the artist applies lip liner incorrectly it warps the whole look of the face and therefore give that unbalanced look. Once the lip liner has been applied, it should be finished off with a lipstick, lip gloss, lip tint etc. If the lip color seems too dark or too much, lips can be blotted with a piece of tissue, this helps to give it a more natural look and not so pasted on. 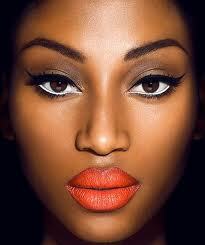 FULL LIPS should be toned down with softer colors since their full shape creates sufficient emphasis. IRREGULAR or NARROW lips can be disguised with brighter of more pearlier/glossy colors, this helps to fill out the lips, giving it a more obvious and fuller effect. Intensity of lip color must balance the rest of the makeup. Working with soft but bright tones permits more improvement with the mouth shape and gives attention to the lips. Believe it or not, the texture of the lips may reduce or increase the apparent size of the mouth or improve the proportions thereof. 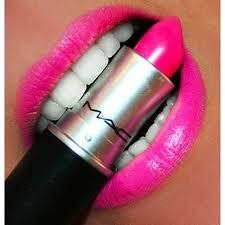 What a client wears for the function may help you with deciding on a color for the lips. Time of day should be taken into consideration as with the rest of the makeup. Remember, like we’ve discussed in a previous ‘class’ that artificial light drains color and day light accentuates color. BLEEDING OF THE LIPS – this happens when the color spreads outwards over the lip lines into the natural skin creases, messing the whole outline. This happens because: body heat causes very creamy and glossy lipsticks and slightly ‘melt’. Fine vertical lines around the lips allow the lipstick to seep into them. 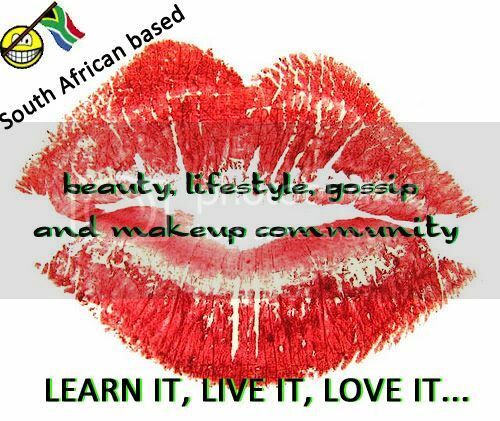 This can be prevented by applying foundation and powder to the lips before applying lipstick. LIPSTICK CHANGES COLOR – This happens when lipsticks contain a blue tone and of course darker tones and therefore it gets emphasized. Apply foundation onto the lips before applying lipstick. LIPSTICK DRYING THE LIPS – This happens when lipstick contain frosted shades or the over use of fillers and binders in the ingredients. Avoid frosted shades and moisturize lips, esp in winter. Line lips keeping to the inside of the top and the outside of the bottom. Use a brighter shade of lip color on the bottom and a darker on the top to give the illusion of it receding to give it a ‘smaller’ look. OR you can apply the lip color to both the upper and lower lips and blend a dot of white into the center of the lower lip for a fuller look in the center. 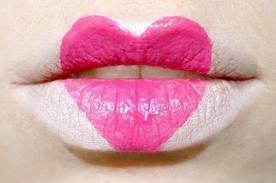 The same rule applies with this lip shape as with the shape above, but the dot should now be applied on the upper lip. Get it? It’s the same, just ‘upside’ down. Better to use a light lip color. Outline the mouth, staying just outside the natural lip line. Thinner lips can pull off the frosted colors, because they give that plumping effect. Opt for softer colors with a early matte consistency, otherwise it can dominate the face. The lines should be even, but not too hard. Stay in the natural borders of the mouth. Effort should be made to make the face to deflect interest to the eyes and cheek bones, diminishing the importance of the lips with the overall effect. 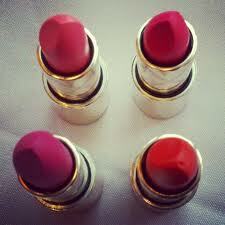 These lips can use matte and pearlised/glossy lipsticks to give the appearance of fullness to the center of the lips. Basically regulating the different lip shapes. Its impossible to make a small mouth appear larger by painting the borders without it appearing too obvious. However, skillful use of color can improve the general appearance considerably. Lighter and darker tones, cream and matte textured lip glosses and outlining lips with pencils are all elements of techniques available to make the artist produce attractive makeup applications. Last tip… If you want to accentuate your lips, do so and keep the eyes simple and vice versa. Hope that this post helped you with your lippy issues. Sometimes, I get my lip line perfect, I have a skew smile, so it bugs me, I try to correct it and it works, but most of the time, I end up looking like a clown and just going with a natural pinkish gloss and just rock it. I do recently love my red lips but, only if I can get my lip line correct to fix my lips. Ah, it frustrates me so! Ah your lips always look good fi! I don’t normally like red lips on myself, but I’m trying to get used to it. You have a flippen awesome smile though! And the pink looks good on you. Hi 🙂 I have a question. I have a straight upper lip, it doesn’t have that heart like shape. I don’t like it, can I use make up to cover it somehow? Hello Ana! Could you perhaps email us a photo of your lips? what is that Mac pink color in ‘lipstick drying the lips’ section ? Apparently its a lipstick called MAC CANDY YUM-YUM, but it also comes in a gloss and lip pencil. I’m sure the person in the photo used all three to get the glossy effect. Hope you have a candylicious yummy time!